This is not the first Digital Photo Frame Keyring ($90) we’ve covered here at GeekAlerts, but the brushed metal design makes it best looking one so far. When it comes to features it’s pretty much what you will find with other similar products. There’s an 8MB storage for the photos, and these can be displayed on the 1.5 inch (128×128 px) LCD screen. 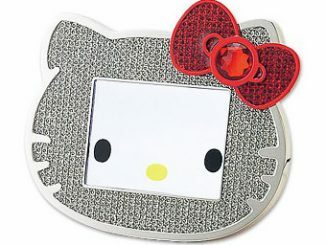 It uses a rechargeable Lithium battery and measures 4.5 x 4.5 x 1.5cm. 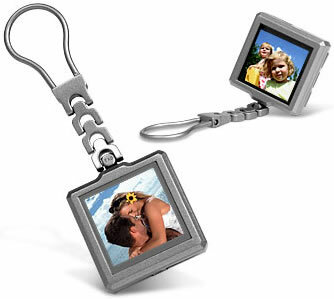 A pocket or purse-sized, brushed metal, key-ring digi-photo album. A 1.5 inch LCD 128 x 128 for viewing your digi-snaps. An internal memory of 8MB. View up to 31 photos in manual or slideshow format. 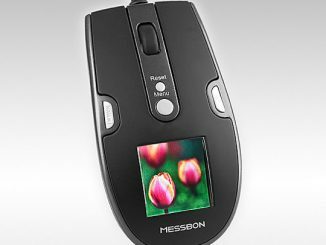 Easy to use software allows you to transfer photos onto the key-ring direct from your PC or Mac. The key-ring will automatically turn itself off to conserve power if left unused for more than 3 minutes. A rechargeable Lithium battery to charge your key ring from the mains or USB. A CD ROM and manual. A battery life of 2 hours. Requires Windows 2000/ME, XP, Macintosh OS X 10.2 and above. Comes in a smart, mock-leather presentation box. Suitable for ages 12 years+. 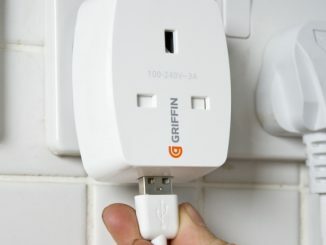 Requires a USB cable (included) and a mains adaptor (UK adaptor included). Size: 4.5 x 4.5 x 1.5cm. Digital photo frame is cool. Digital photo frame, display digital pictures without a computer, fashion design, share beautiful photos with your family and friends, bring spice and joy to your life. It is an Ideal holiday present for your friends or lover. You need not to print, easily view pictures which transferred by a USB interface. It is the best way to remember family, friends, and events. These are cool. I just gave one to my mother-in-law for Xmas! I have a few sites I go to, but the quality is always the best here! It’s easy to tell we’re getting closer and closer to the Christmas holidays, Santa webcams and other X-mas gadgets are rolling in like never before. We’ve covered quite a few of these popular digital photo keyrings here at GeekAlerts, but this is probably the best looking one so far. 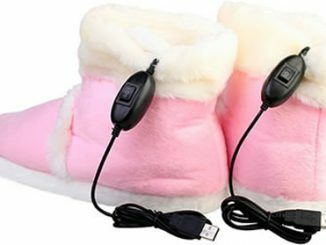 What’s up with gadgets and foots? It wasn’t long ago we covered the foot webcam and now we can all get a keychain photo frame in the same style. This green (it’s also available in silver) digital photo frame features a 1.5-inch LCD screen and 2GB of storage capacity. It also sports a built-in MP3 player. Here’s a handy way to bring some of your favorite digital photos when you’re out traveling, and being able to view them without the need of AC power. This small digital photo frame features a 1.5 inch large TFT LCD screen with a 128 x 128 pixel resolution and a built-in 64MB memory (up to 180 photos).